Think you got what it takes to become upper management? Think you got what it takes to own the office marketplace? Give Office Wars a whirl. Office Wars is a game about buying low and selling high. Start by picking a loan, it is due in 32 days, while you try to earn as much money as you can by selling office supplies to co-workers. After 32 days, you’ll be ranked on how well you did and have a chance to add your score to the top 10 best players. 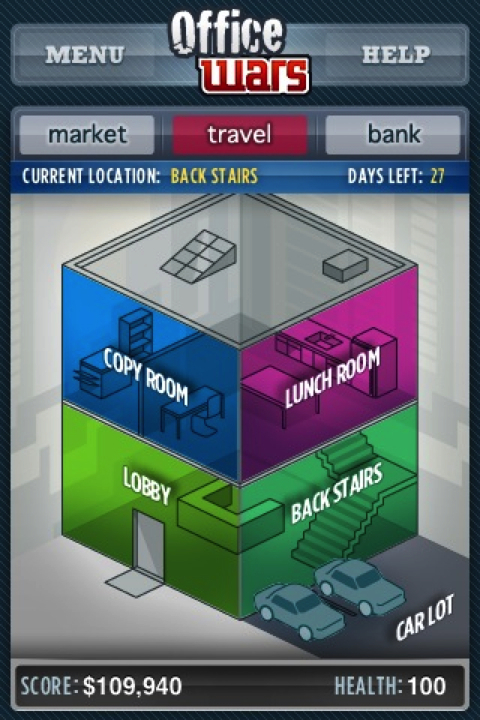 Office wars is a great business strategy game for the iPhone or iPod touch. – Quick, easy and addictive gameplay! – Limitless game outcomes for super re-playability! – Random daily events that affect gameplay! – Top 25 High Score list! AppSafari review of OfficeWars was written by Joe Seifi on March 13th, 2008 and categorized under App Store, Fun, Games. Page viewed 6581 times, 2 so far today. Need help on using these apps? Please read the Help Page.